At an elevation of 200 meters (600') above sea level, in 2001 about 5 acres of vines were planted, all from local clones of the traditional Montepulciano grape. This region, called the "Colline Teramane" after the nearby mountain town of Teramo, is aknowledged to produce the finest wine in the region. It is the first and only zone in the Abruzzo to be given the Italian government's highest quality ranking of DOCG (Denominazione di Origine Controllata e Garantita). The first small-scale vintages of Monepulciano were made in 2003-4. 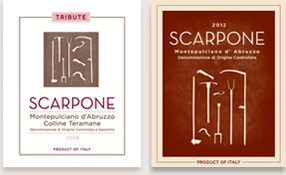 In 2005, the first Scarpone Montepulciano d'Abruzzo DOCG was made, with the assistance of highly-respected local enologist Loriano di Sabatino. It was custom-crushed at the nearby state-of-the-art winery of Centorame, where young Lamberto Vanucci himself makes spectacular Colline Terramane wines. The wine was aged for 14 months in new small French barrels. Three hundred six-pack cases were made. This wine represents the culmination of a generations-old dream for Lorenzo and the Scarpone family. It is a special tribute to Lorenzo's father Vincenzo, who taught him to love and respect the land, and to enjoy the fruits of their very special "terroir" with family and friends around the world. In 2005, the first Scarpone Montepulciano d'Abruzzo DOC was made, with the assistance of highly-respected local enologist Loriano di Sabatino. It was custom-crushed at the nearby state-of-the-art winery of Centorame, where young Lamberto Vanucci himself makes outstanding Colline Terramane wines. This special cuvée represents the culmination of a generations-old dream of Lorenzo and the Scarpone family. It is a special tribute to Lorenzo's father, Vincenzo, who taught him to love and respect the land, and to share the fruits of their very special "terroir" with family and friends around the world. Dark garnet color Deep ripe plum flavors. Firm tannins have been mellowed, but not overwhelmed, by the oak. Drinking beautifully already, but will gain complexity with 5-10 years of bottle aging. Ideal with Abruzzese lamb dishes, or any substaintial meats. Pasta with meat sauces. Aged cheeses, especially pecorino. For the 2012 vintage, the more mature vineyard produced a larger crop of very high quality grapes. We were able to make a slightly larger quantity of wine, in the traditional fresh and lively style of Montepulciano. We were very fortunate to have a house in the midst of such an ideal wine growing area! Fermentation in stainless steel, then aging in large Slavonian oak barrels. Bright and fresh berry fruit. Excellent depth of color and flavor. Naturally soft tannins make it very accessible for current drinking. Will improve for at least 5 years (but will probably all have been enjoyed long before that). All tomato pastas and pizzas. Grilled chicken, meats and sausages. Mozzarella and medium-strong cheeses.